LIBERAL, Kan. – The No. 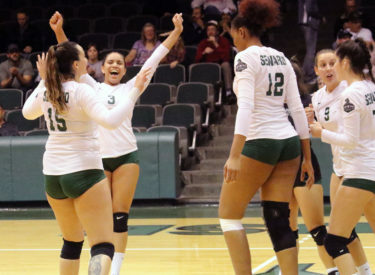 11 Seward County volleyball pulled off a sweep of their rival, Hutchinson on Saturday night in the greenhouse, winning in straight sets 25-9, 25-19, 25-21. The win pushes Seward to 20-5 overall and 9-0 in the conference. The 20 wins marks the 25th straight season that the Lady Saints have won at least 20 matches. After trailing 3-2 to begin the first set, the Lady Saints put their foot on the gas winning the next eight points, starting with a Luz Sierra kill. Hutchinson ended the run with a kill, but Seward didn’t let up, winning the next five points to take a double-digit lead at 15-4. Seeing the end in sight, the offensive attack of the No. 11 squad put the set away, coming up with five kills and an ace over the next ten Seward points to win the first set 25-9. The Lady Saints were nearly perfect in the first set, hitting an unfathomable .591, with just one attacking error off 22 attempts. There appeared to be some déjà vu to begin the second set, as the Blue Dragons took a 3-2 lead, but Seward answered with a run to take command of the set 7-3. The Blue Dragons prevented the set from getting out of hand, cutting into the Lady Saints lead midway to make it just a two-point game at 17-15. Hutch would be unable to get any closer as the Lady Saints put the Blue Dragons away 25-19 to take a two-set lead. Trying to prevent being swept by a rival, the Blue Dragons gave Seward everything they had in set three. The score stayed tied until both teams held 14 points. Two kills by Djuly Schmorantz and a block by Giovanna Tapigliani gave Seward their largest lead of the set and allowed some breathing room. After taking a 23-18 lead, Seward came away with three consecutive blocking errors to give the Blue Dragons some a little life, forcing the Lady Saints to take a timeout. Coming out of the timeout, the Lady Saints wasted no time putting an end to the Hutchinson momentum, ending the set with back-to-back Schmorantz kills to win 25-21 and complete the sweep of the Blue Dragons. Schmorantz (13 kills) and Tapigliani (10 kills) led the Lady Saints offensive attack, while Sierra added 10 points off eight kills and two blocks. As a team, Seward hit a combined .386 with 42 kills coming off 83 swings. Sophomore libero Nathiellen Machado stood strong on defense, finishing with a team-high 15 digs. Tapigliani came up two digs short of a double-double, finishing with eight. The Lady Saints will travel to Dodge City on Monday for a 6:30 p.m. match against the Conquistadors.